It can be difficult to be seen as a legit pirate when you're hitting the high seas for the first time. No Jack or Charli is going to want to share his grog until his fellow mate has a few scars or, better yet, a missing leg. The thing is, not many modern folks have the fighting skills it takes to really gain the trust of a rough and ready crew these days. You'd most likely be fish food before they helped you out with some fancy fencing work. Want the veteran Buccaneers to have your back? You need to look like you belong. 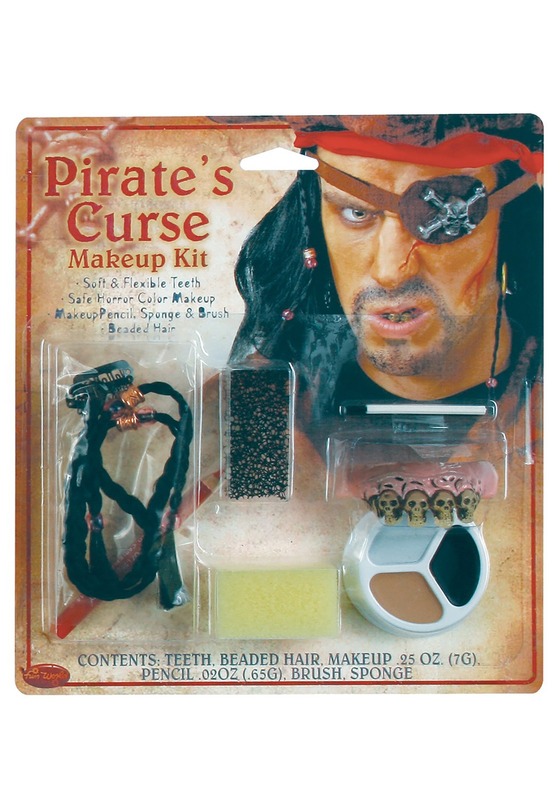 Rough yourself up with this makeup kit and when you'll look nice and tough when your set sail for your long trip in the Caribean. You don't even need to travel around the world to look tough once you get this treasure of a makeup kit. You'll get a braid of black hair that clips into your own hair. Three colors of creme makeup allow you to create scaring, dark eye circles, and dirt, a ship's not exactly a clean place after all. Not confident when it comes to makeup? This kit comes with instructions so you can transform with ease. Top the whole thing off with the dark skull carved teeth and you'll have a face that Blackbeard would hire in an instant! Whether you're heading out onto the open ocean, practicing Talk Like a Pirate Day, or heading out for Halloween, you're sure to be taken into the rough crowd with open tatted arms now that your face looks the part. Take it to the next level with our amazing selection of pirate costumes and accessories!